The DeVilbiss SleepCube SmartLink Module provides you with an ideal way to ensure that you are making the most of your sleep apnoea device. 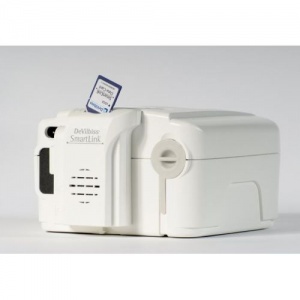 The SmartLink module is a device which attached to the back of any model in the SleepCube range. 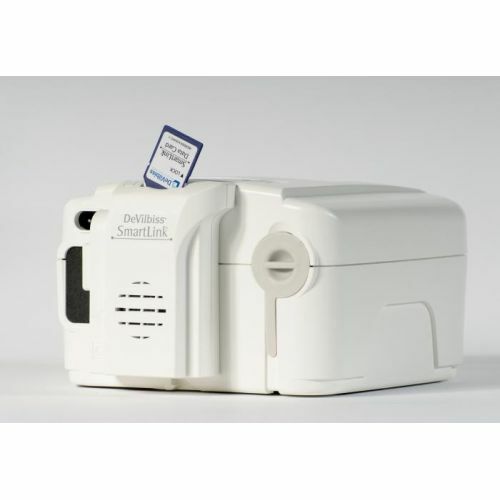 It records and stores patient data, which can then be transferred via direct device download or SD card and card reader to the SmartLink Desktop Software Package (which must be purchased separately). This allows the physician to analyse and monitor patient compliance data and evaluate the effectiveness of treatment. The SmartLink module also offers the possibility of adding a pulse oximeter for measuring SpO2 and pulse rate values. Up to three years of basic compliance data can be stored using SmartLink. When attached to a SleepCube Auto, up to 120 days of detailed therapy data can be collected, giving all the parameters needed for overnight assessment or titration purposes. The SmartLink module is not unique to one specific device. Once the monitoring period is complete, the module can be removed and applied to another SleepCube unit. Can a standard SD card be used? Standard SD cards are compatible with the SmartLink Module. Does the SD card need to be kept in the SmartLink module whilst not in use? No, the SmartLink module can record up to 3 years of usage data. The SD card needs only to be inserted for data transfer from the module to the PC using a card reader. For direct transfer from the module to the PC, no SD card is required. Where do I purchase a compatible card reader? Standard card readers are available from most electrical stores. Alternatively you can purchase a card reader from us directly. How often does the memory need to be deleted from the SmartLink module? The DeVilbiss SleepCube Standard Module features a rolling memory. This rolling memory means once capacity is reached, it will automatically record over the oldest data. The memory can be deleted if you wish however this is not necessary as the software will detect the latest data from the SD card or module directly and only import brand new data. Is it possible to tell which module is paired with a particular device? Yes, when the module is connected to a device, the serial number is stored within the module. If this is then paired with another device a verification alert will appear to ensure the correct device is being used. If you have any questions about the DeVilbiss SleepCube SmartLink Module, please contact our Sleep Apnoea Services customer team on 020 7720 2266.